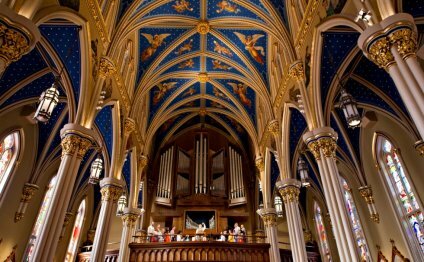 The University of Notre Dame Folk Choir serves as one of the principal liturgical choirs in the Basilica of the Sacred Heart, singing at the 11:45 a.m. Mass every Sunday throughout the academic year. They also lend their talents to dedication services, vespers, memorial liturgies, penance services, weddings, ordinations and a host of other worship celebrations that form a vital part of the fabric of worship on campus. The Choir's musical offerings have been gathered from all parts of the world. Special emphasis is placed on contemporary music, sung almost entirely in four-part harmony. Many of these arrangements are exclusive to the Folk Choir, having been arranged by its directors and a variety of other composers active in the field of sacred music.